I love the mental buzz, the energy and the smug sense of knowing I have just done something good for myself when I finish an exercise session. That’s what gets me up and going. See, it doesn’t matter what your motivation is, it just matters whether you do it or not. Some people set themselves goals: “I’m going to run 10km”, “I’m going to lose 5 kg”, “I’m going to lift 20kg weights”, which are all great. The important thing will goal setting though is that it must be realistic. So if you’ve not a runner, or have an injury that prevents you from running, don’t start with a marathon. I got into running, thanks to one of my, very naturally athletic, brothers. He is one of those very irritating people who can run a marathon with about 2 weeks training (yep, he actually did, and smashed it). If he eats too much and starts feeling like the pounds are creeping on, he’ll put on his trainers and go for a 15km run without any issue. 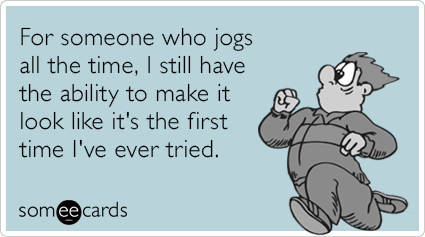 I, on the other hand, needs weeks of training to be able to run that far! One night, in about September 2012, we were sitting in our local and after a few “end of a hard week-ers”, he challenged me to run the Sydney half marathon which was in the following May. I began thinking about what would entail. It was daunting. A half marathon is 21km. At the time, 7km was about my limit. But then I started thinking about what other people would say if I did it, and how I would feel crossing the finish line. “Right,” I thought, “I’m going to do this, purely because people don’t think I can”. I trained, by myself, for the next 6 months. It was bloody hard. But I loved it. I loved the satisfaction of increasing my distance each week. I loved the energy it gave me, especially if I had time to run before work. I loved my friends telling me they were proud of me, and asking how I found the motivation to train alone. I loved putting my ipod on, playing horrendously cheesy music that quite frankly wanted to make me break out into some quite lethal dance moves in the middle of the Harbour Bridge. When I’d had a tough day, or something was bothering me, I loved the knowledge that I would, quite literally, run away from it all. At least for an hour. I loved running in the rain. And I loved the day of the run. I had put very little pressure on myself – I just wanted to finish it, and if I did it in 2 ½ hours, I would have been pleased. I ended up doing it in less than 2 hours. Now, don’t take this as a “look at me and what I’ve done, and if I can do it, anyone can….blahblahblah” speech, I just want you to see that it doesn’t matter WHY you do it. I did it to prove something to myself (and my friends!). You might want to lose that 5kg, you might have a health concern that can be improved through exercise. Whatever it is, find it and get going! Don’t wait until this is you! The great thing about exercise is that EVERYONE can do something regularly. My experience as an Exercise Physiologist has been primarily in chronic disease management, meaning that most of my patients suffer from complex medical conditions, ranging from high blood pressure, diabetes, cancer, to arthritis or significant “physical impairments”. The oldest patient I have seen is 94, and the youngest is 10. It is my job to ensure that people, no matter their age or physical capacity, are able to exercise safely, and improve their quality of life in some way or another. And so on and so on…! As I mentioned in a previous post, it is most important to find something you enjoy doing, and do it RIGHT. I’m hoping that in this blog, you will find some inspiration and start to believe that, no matter what stage you are in life, exercise will help in some way or another. A comprehensive resistance exercise program should involve both isolation and compound exercises. Isolation exercises focus on a particular muscle to ensure it is working properly. This will then enable the muscle, and subsequently, the joint to perform correctly, improving its functionality and reducing pain. Compound exercises, however, are more ‘functional’ as they involve more than one joint, and more than one group of muscles. Compound exercises, such as a squat, are important to maintain functional strength, for example being able to sit down and stand up out of a chair. The exercises that will be mentioned on this blog will be a combination of both, and I will try and stipulate which is which! Sound familiar?! 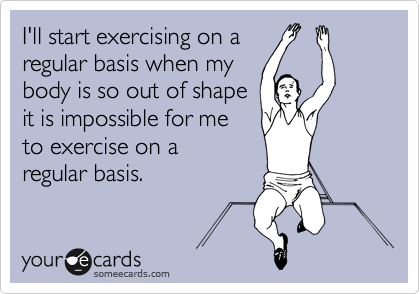 Not exercising is easy. But as we all know, it is “good for us” and not exercising can be detrimental to our physical and emotional well-being. You will have heard this all before, but it is important to try and find a type or style of “exercise” that you enjoy, so that it becomes not a chore, but part of your daily routine, like brushing your teeth. Exercise routines need to be a combination of cardiovascular exercise (or “aerobic”), such as walking, jogging, cycling (all of which can be done inside or outdoors so don’t let the weather be an excuse! ), and resistance training (or “weights”), such as push ups, squats, lunges, or with hand weights or machines that you would find in a gym (again – don’t let the weather be an excuse!). In the experience I have had, most people seem to find cardiovascular exercise easier to get their heads round and do – walking the dog, walking with friends or going for a lovely, mind-clearing jog, and it is the resistance training that seems to be harder to fit into your day. Part of this blog is to try and demonstrate a few examples of some resistance exercises that you can do, quite easily, at home with minimal or no equipment. “But I’ve seen this a million times before!” I hear you cry! Yes, so have I. But as an exercise physiologist, my primary focus when prescribing or instructing exercise is to get it RIGHT. If you fail to perform an exercise with 100% correct technique, you will not only lose the benefit of the exercise, but you will also significantly increase your risk of injury. Part of my experience as an Exercise Physiologist has been to rehabilitate muscle sprains and strains of patients who have performed exercises incorrectly. And unfortunately, once you have sustained an injury, you are more at risk of re-injuring yourself, so as I’m sure you’d agree, it’s much better to get it right to start with and avoid injury altogether! So, strap yourself in and get ready for some exercises and advice that will get you moving without injury! So what, exactly, IS “Exercise Physiology”?? Exercise Physiology is the study of how exercise impacts the body. Good question! In a nutshell, Exercise Physiology is “the prescription of exercise to assist in the management of chronic disease”. It serves to improve quality of life and maintaining independence. In my job in Sydney I saw patients with cancer, diabetes (Type 1 and 2), osteoporosis, arthritis, stroke patients, people with muscle injuries or “impairments”, and everyone in between. A principle exists, known as “Exercise is Medicine” (http://exerciseismedicine.org) whereby exercise is, quite literally, seen as medicine. It helps to treat many conditions, but the “dose” has to be right. For example, an 80 year old with arthritis probably shouldn’t be prescribed a 20 minute jog on the treadmill for his cardio training… Exercise Physiology is about finding what that correct dose is. It assesses the individual and prescribes exercise based on their physical (and sometimes mental or emotional) condition. There is a whole “branch” of Exercise Physiology which looks at the healthy population, namely sportsmen, women and teams. My area of expertise, however, is in chronic disease management, and that is what I’m going to stick to! So if you want to know how to improve your lower back pain, what exercise can do for diabetes, or how to recover from a shoulder injury, read away!